Yeah well, not every taxi rank/bus interchange (esp Tuggeranong) has a trolley return with a chain plug-in thing, nor other trolleys around to get the coins back. I would suggest if you are taking your shopping on a bus you don't need a trolley to take your shopping to the interchange then. Otherwise how will you get it onto the bus and the shopping home when you get off? Clearly it is a carryable amount you have. And ps wife and I used to live in London, no car and took our weekly shop on the bus and no need for a trolley to get it to the bus stop. That's what our arms and hands are for! Well I had 2 trolleys filled to the top, and considering there was only a 900 left, there was no way in hell I was going to carry all that home. Two trolleys? Really? Have you ever done any shopping in your life? Or does mum do it all and your rage at this measure is either illinformed or simply me too faux rage? And if you really are serious then I don't think in this circumstance you forging your $1 deposit is a big ask is it? Not like it is the supermarkets issue to run around finding trolleys you clearly before felt you could leave anywhere you liked before hand. I do the same shopping every month, usually with 2 trolleys, sometimes 3 when the bulk buying is required. Mum doesn't do the shopping anymore, cause she can't walk - she barely leaves the house anymore for that matter. Have you ever done any shopping in your life? Or does mum do it all and your rage at this measure is either illinformed or simply me too faux rage? Don't get bitchy with me please, I'm angry at the Government, I don't want to be angry at you too. Just this once, I agree with you. But the problem is that there are multiple trolley variations (large & small, and three supermarkets + Big W, Target, KMart etc.) - one trolley collection point isn't going to work now at bus stations and taxi ranks anyway. It's hard enough inside the carparks. But as for your shopping habits - perhaps you should consider using the online, home delivery services that Coles and Woolies offer. Cheaper than a taxi. Otherwise, you might want to invest in one of these. Perhaps you could contact the Hyperdome and/or the retailers to request that the trolley bays have the return keys installed? This is only in place because people weren't returning their trolleys to the store or a trolley bay. "Somewhere close" doesn't cut it. And agree with Barry - have you tried online shopping? I've only used it once but it was dead easy, you can pick a delivery time window, and the delivery driver even brought everything into my house and popped it onto the kitchen bench. I can guarantee the delivery cost will be less than your taxi fare. I too have used online shopping before, it is a great service and was very easy to use with a minimal delivery fee. As for the trolley deposit, sadly the Government has had to implement this system as there were too many rouge trolleys around the place. Supermarket trolley contractors were not collecting them when reported and customers were doing the wrong thing by taking them outside the area of the shopping centre, so they have brought back the old system of a coin deposit (or token if you have one). If there is not one in the area you need then contact the particular supermarket chain you shop at or centre management and let them know. Often places outside the carpark are overlooked so they just need someone to push and remind them that trolley return bays exist at taxi ranks and bus stops/interchanges. Ironically the Hyperdome, or more specifically the Super KMart store (for those that cannot remember think combined Kmart and Coles) had the coin deposit system from day dot in 1987. Think it was 20c back then. Believe me, I have considered home delivery from online shopping many times, but cause my mum's a technophobe, so we don't use any means of online shopping, nor use a bank card of any sort tied into anything other than a savings account. Otherwise we probably would've been doing it long ago. I feel that online shopping is less fun, cause you don't get to immerse yourself in the actual activity, and like buses, I've always loved pushing trolleys around but I do understand what the point of it is, it's easier and I guess cheaper and less time consuming. We do already have a trolley, but mum and I only use it for emergencies for when we're carrying something big, or if she's shopping by herself. Otherwise I use my old shopping method of carrying 2-4 shopping bags on my bikes handle bars - probably a shopping method I should go back to. Quote from: Sir Pompously link Often places outside the carpark are overlooked so they just need someone to push and remind them that trolley return bays exist at taxi ranks and bus stops/interchanges. I've been saying to my mum the past few years (and maybe it should've been something I should've suggested long ago), to putting some sort of proximity or gps device on the trolleys so an alarm goes off on the trolley or the shop managers can see where the trolleys are if they go outside of the shopping/center areas. Something not too complex, but something that works in a way that the hidden barcode on the baskets work (the one that sets the alarms off if you try taking a basket out of a store). Quote from: ajw373 Think it was 20c back then. Dayam, if it were more like that now, I think I'd be somewhat happier. I do remember Dan Murphy's trolleys always having the pay lock on them back to 1997, I think they removed them a couple years ago (till now) but they were $1/$2 ones too. I would of thought most Banks would of sent out Savings Account linked debit cards by now. While doing a quick search doing a quick search, accounts can be set up at Coles (didn't check Woolies). I've sent a generic rweet to Coles about calling orders in. Another option, have you considered spreading the big shop out? I normally buy one big thing each week (as needed),my only big shop is for the Xmas cake & pudding ingredients. The biggest advantage is occasionally buying 2 or 3 things & a few bottles of milk. You should probably make sure you don't carry eggs on the handlebars, I once did that and a couple of the eggs broke (although I was probably a bit fast on the bike...). You can also buy a cheap Aldi 'token' which acts like a coin in a trolley if you don't have spare coins around too. Is Mawson Woolies not an option? Also, proximity trolley locks already exist. Not sure if any stores in Canberra use it though. I've seen it at a Coles in Melbourne. That makes sense in some ways, but also makes the point of the locks even more stupid. The fact that you can chain trolleys to other shops would make it even more hell for the returners, and preventing it on others means you can't get you money back without having to find a match somewhere else. The Woolworths trolley collector at Woden Bus Station today had a metal thing around his neck which he slotted in to split the Coles and Big W trolleys that were joined back to back. They don't need to be that fancy either. 20 years ago I lived in Rockdale in Sydney and the plaza had metal mats made out of material like escelator/travelator tread, about 1.5m long that stopped/made it very hard to take trolleys beyond the boundary. Obviously a lot easier to do this in that mall than it would in say Belconnen, but anyway example of a very simple and effective system. ....and the plaza had metal mats made out of material like escelator/travelator tread, about 1.5m long that stopped/made it very hard to take trolleys beyond the boundary. I often wonder with those travelators that don't let you push the trollley - what happens if they malfunction or if there is a blackout. How do you move you trolleys to the other floors or to the car park as you cannot push them on the travelator? After all, we've all seen escalators that don't work or are out of action, so no doubt travelstors break down or are out of action at some stage too. Gungahlin marketplace is one example, if the travelator breaks down or doesn't work, then how do you get your trolleys to the car park? You could always take your shopping out using your hands and arms and carry them to your car? Quote from: Stan butler on March 06, 2017, 07:29:18 pm what happens if they malfunction or if there is a blackout. 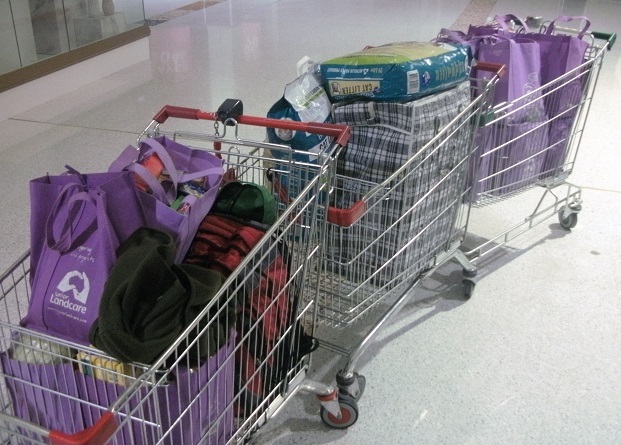 How do you move you trolleys to the other floors or to the car park as you cannot push them on the travelator? Generally speaking, the grooves that the travelators have will lock the wheels into place, but what I've noticed is that is you push at the right angle and hard enough, you can actually push a trolley from one end to the other - if you were to do this on a broken one, it would probably take a while and a lot of effort, which is why I would suggest taking a lift (elevator) or something. I wouldn't be taking the lift during a blackout. At the mall I usually use, the travelators have a little symbol at the entry points prohibiting trolleys. This is duly ignored by nearly everyone. Woolworths Dunlop is my favourite store; it is the Woolworths that should not really be called a regular Woolworths. It is more like a Woolworths Metro store like those that are found in Sydney. SupaExpress Red Hill is under construction now, replacing a former Friendly Grocer; it will be open soon. Currently there is no supermarket at the Red Hill Shops; I recommend visiting Coles Manuka if in the area.